Prepare to be sugar shocked, because sugar is in just about everything. What do you think of when you read the word "sugar?" For most of us, we picture sweet treats like candy or donuts, and not salad dressing or a loaf of sliced bread. That's because not all of us are aware just how many of our favorite "healthy," or at least non-sweet foods have added sugar in them. And that's okay! Because I didn't really know the extent of it either until I embarked on a five day sugar detox. Lots of foods contain sugar, but that doesn't mean they need to. There are naturally-occurring sugars, like the ones found in fruits and certain vegetables, and then there are added sugars, like what you would use when making cookies or a cake. Adding sugar to a dessert recipe makes sense, that's pretty much the point, but adding sugar to your seemingly-healthy breakfast of yogurt and granola? Not so much. 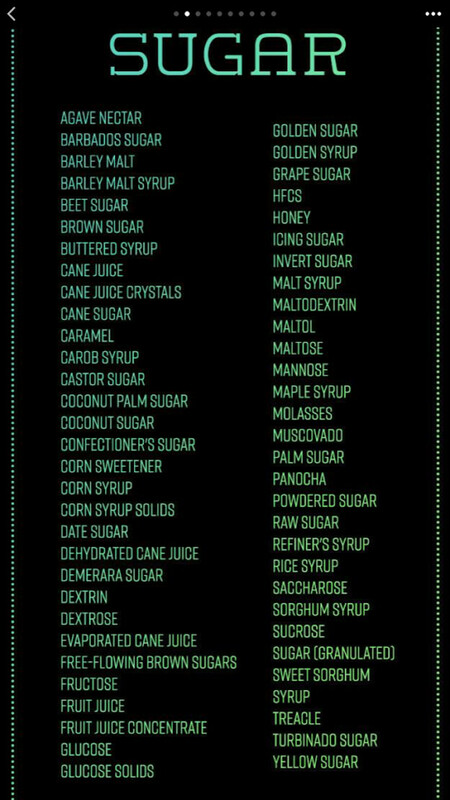 What's even worse is that sugar goes by a long list of other names, making it quite difficult to flesh out which of your everyday foods contain added sugar or not. Sugar isn't the enemy, but consuming excess amounts of sugar on a regular basis is pretty bad for you. Excess sugar consumption is linked to everything from heart disease, diabetes, and insulin resistance to dementia, cancer, and even acne. Sugar also causes inflammation in the body, which exasperates any and all of these conditions, and forces your body to function in a heightened and stressed state. That's no bueno if you ask me. 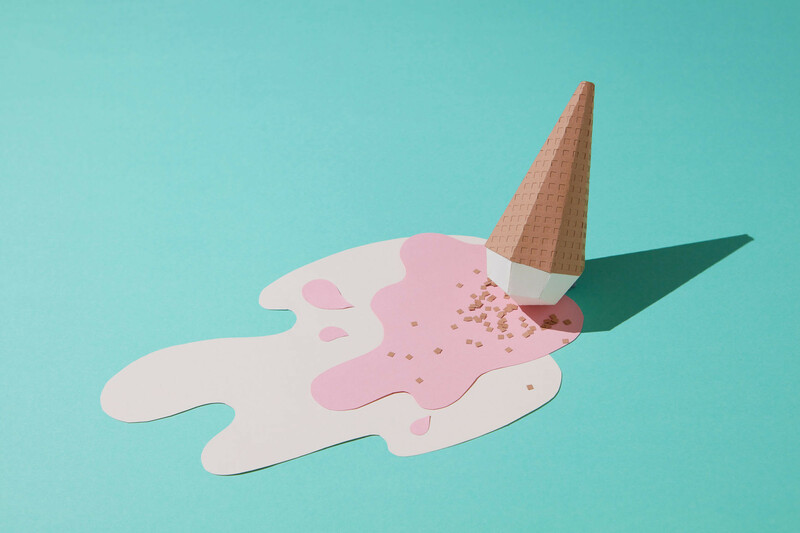 On the flip side, eliminating or reducing sugar consumption has been known to increase brain performance, reduce water retention, balance hormones, and help you maintain a healthy weight — basically, the less added sugar you eat the better. Which brings me to my sugar detox. 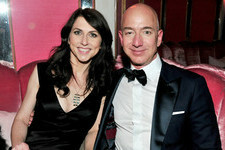 Though I'm typically not a fan of detoxes (it's all about balance! ), this was one detox I could get behind. 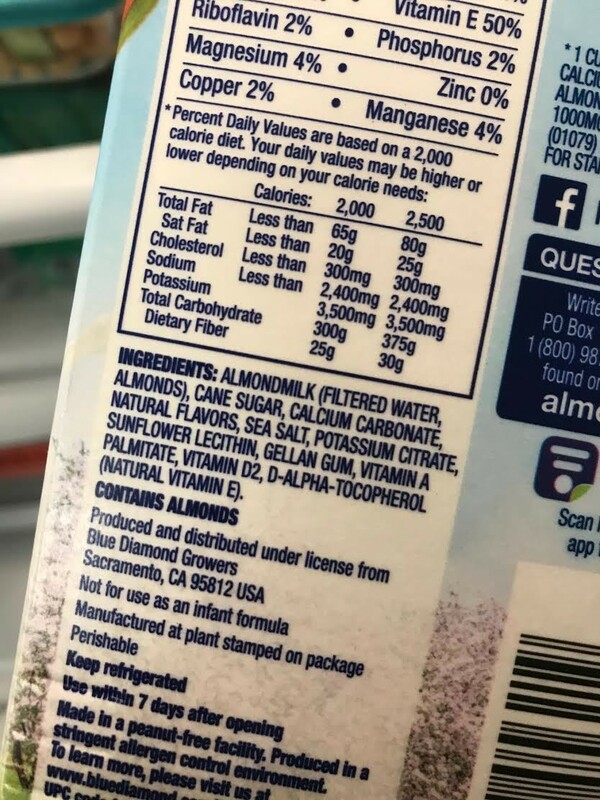 While I already suspected I didn't have a full-on sugar addiction, I still thought it would be fascinating to be totally aware of the ingredients in my food. I knew this would be especially eye-opening when it came to the foods I eat while at work, because there is no way all those snacks are sugar-free. Therefore, I embarked on a five day added sugar detox, avoiding all added sugars, including honey and maple syrup. Come with me as we take a look at how it went. I may sound crazy, but on Monday — day 1 — I swear I woke up extra hungry. I think I was experiencing panic in anticipation of what I wouldn't be able to eat. That, and it was Monday, and you know how Monday mornings go. I made chia seed pudding, but an hour after eating it I still felt ravenous. Did I not eat enough the night before? I don't know. As luck would have it, our office was abnormally lacking in food. We also only had "original" soy and almond milk, which is packed full of added sugar, so it was black coffee for me. I don't add sugar to my coffee anyway, but still, I would have appreciated a little milk. As I continuously looked through the cabinets to try to find food that clearly didn't exist, it dawned on me that I probably wouldn't be able to eat lunch. On Mondays, my work provides lunch, but considering it's coming from a restaurant, it was highly unlikely it was added sugar-free. Great. Unable to eat any of the bars we had, I resorted to eating mixed nuts and popcorn at 9:50 a.m., and then a Babybel cheese, because that light-as-air olive oil popcorn did nothing for me. Lunch was paninis and salad. Since I had learned that almost all bread had added sugar, there was no way this bread would pass the test. Therefore, I literally unassembled my panini and remade it on this sugar-free bread from Alvarado Street. I looked like a weirdo for sure. As for the salad, I stuck to the balsamic vinaigrette which I realized probably had sugar in it, so I guess I kind of failed already. Oops! Once I was home, avoiding added sugar was much easier. I made Mexican lettuce wraps for dinner, and prepped some food I could bring for the following day. 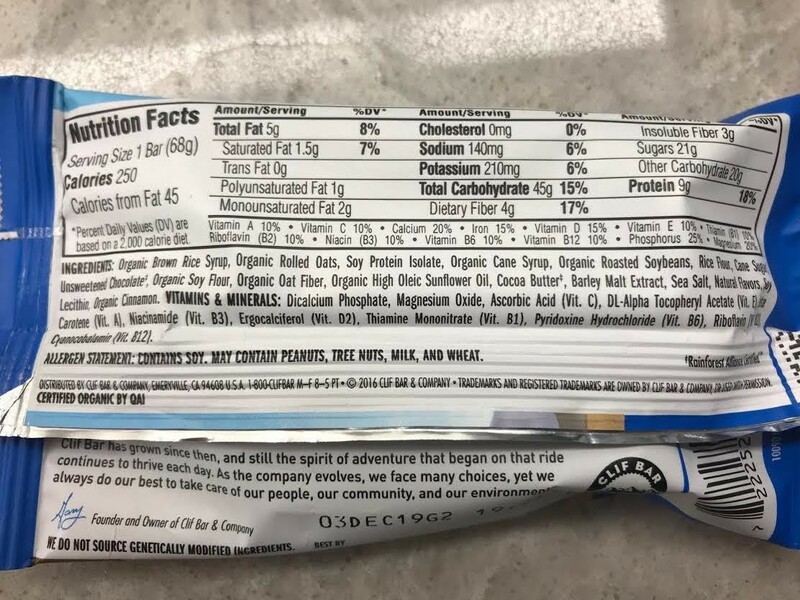 FYI: Check out the ingredients in this Clif Bar. I'm not the biggest fan of these bars anyway, but damn — the first ingredient is sugar, with two other forms of sugar following not too far behind. I went into day 2 feeling a lot better. I had oatmeal with almond butter for breakfast, along with coffee with (real) milk. The oatmeal kept me full until lunch, thank god. For lunch, I ate a big salad with roasted sweet potatoes I made the night before — and goldfish, because a girl needs to snack. In the afternoon we got a delivery of juices so I drank down one of those, and then ate Pirate's Booty. It was a coworker's last day in our office so we opened some rosé. I had told myself I wouldn't drink, but how could I resist rosé? I couldn't. In my defense, I did look up the wine to see if it had added sugar, so I think it was okay. At least, I hope. When I got home I ate a few dolmas (why do I feel like I'm the only one that likes those?) and then salmon and veggies for dinner. Easy! Coffee with milk and avocado toast for breakfast. For lunch, I had leftover chickpea pasta with garlic and olive oil, which was extremely boring. I of course felt very unsatisfied, so I needed to eat Pirate's Booty to get my fix. I worked out after work and when I got home I was seriously craving some carbs (was this a roundabout way of craving sugar? ), but unfortunately, my bread had added honey in it. Thankfully, I had a plum on hand and that very much hit the spot. It made me realize I should probably eat more fruit to get my sugar fix. I also hear that when you detox from sugar your taste buds reset and things start tasting a lot sweeter. I know it had only been three and a half days, but that plum tasted pretty damn delicious. 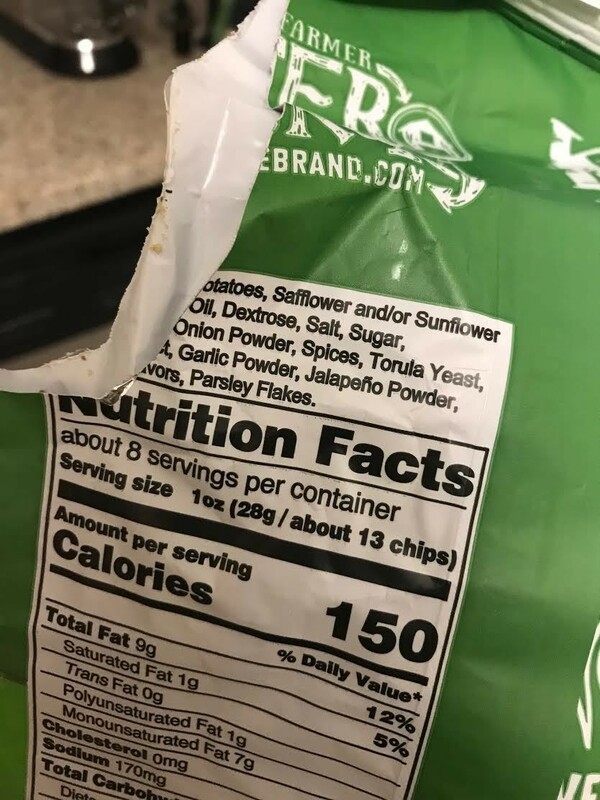 My husband was snacking on his favorite Kettle Chips, the jalapeno flavor, which I hate because they are so freakin' addicting I can't stop eating them. Anyway, naturally I looked at the label to see if I could indulge, and found out the very disheartening fact that they didn't just contain one type of sugar, but two! While you're fooling yourself if you think potato chips are healthy, we tend to consider Kettle Chips a little better than, let's say, Lay's. Are they though? Because added sugar is not necessary as far as I'm concerned. Womp. For dinner, I had a big salad (from leftover ingredients) and then wanted some chocolate, but alas, I went dessert-free for the night. Finally! I had coffee and milk, toast and cream cheese to start my day. Our office manager brought in bagels, and after first wanting to cry that I had already had toast (I get into the office earlier than most people), I realized I probably wouldn't be able to eat the bagels anyway. Really dodged a bullet there. At lunch, I went to Whole Foods to hit up the Beauty Week sale and wanted to grab some soup to eat with the chickpea and cucumber salad I brought from home. 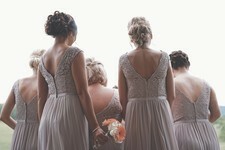 Hello sugar! Yes, even a "healthy" store like Whole Foods adds sugar to their soup. Think about that for a second — sugar in your soup — why? 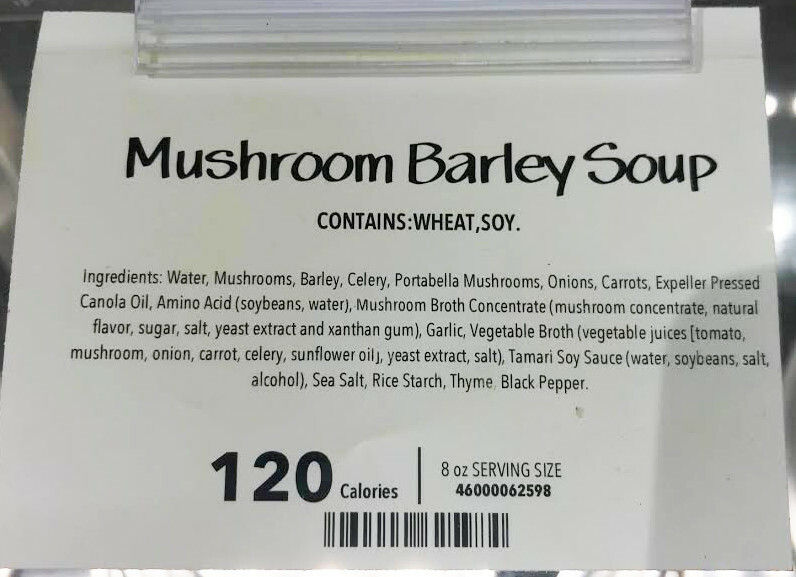 I found a lentil soup that didn't have sugar, and it was great, but check the ingredients in this mushroom barley. Also, canola oil... but that's for another conversation. It was Friday night and my husband and I talked about using a gift card we had to an Italian restaurant. I really, really wanted to go but knew I shouldn't, and that sucked. Instead, I opted for a martini (there's no sugar in vodka right?) and a simple meal at home, fully intending to use the gift card the following day. If this detox taught me anything it's that added sugar is in everything, and if you're going to avoid added sugar without preparing your own food, you're probably going to starve. Processed foods are by far the biggest offenders, but as you can see from my stroll down the soup aisle of the hot bar at Whole Foods, even "healthy" foods contain sugar. That being said, I do believe moderation is key. Take bread, for example. You can find some super high quality breads that have very small amounts of honey in them, and I think that's okay. What I wouldn't want to contain added sugar is, for example, salad dressing, which is something you can totally make on your own and ensure you're getting only the most simple and pure of ingredients. Eating out while avoiding added sugar is next to impossible, bringing me back to the importance of preparing your own food. If you're someone who often eats frozen meals (even those from Trader Joe's) or take-out, you're probably consuming way more sugar than you should. The meals I made throughout my week (minus day 1), were incredibly easy. Avoiding sugar does not have to be difficult, as long as you're willing to spend a little extra time packing your lunch, or whipping up a nutritious dinner. Fortunately, I cook almost every night and eating added sugar-free at home was pretty easy. I do love going out to dinner though, which I think is okay as long as you're filling the rest of your meals with mostly sugarless foods. Throughout these five days, I overall felt pretty good, with the one negative being I sometimes felt hungry. In general, I'm considered a "fast burner," meaning I have a pretty quick metabolism. During my added-sugar detox, I happened to not work out as much, simply because I was busy and my schedule did not allow for it. I believe this actually benefited me because when I workout I get hungry AF and need food in order to keep myself from becoming a ravenous, insane human. I don't think my body necessarily needed added sugar (because it doesn't), but I think I needed more healthy carbohydrates in general. Getting in more carbs, even when avoiding sugar, is absolutely doable, it just requires you to seek out and prepare the proper foods. While I think it's great to strive for added sugar-free foods, you should never become obsessive about it to the point that you find yourself forgoing food altogether. There is a huge difference between drinking a soda every day and having a Nature Valley bar when you're in a bind. If you're thinking of trying a sugar detox yourself, I urge you to approach it with a sense of wanting to gain awareness, rather than trying to restrict yourself. And remember, moderation is everything!